The invention concerns a flat fire-resistant safety cable (1), comprising: at least two electrical conductors (3), one insulating layer (4) around each electrical conductor (3) to provide at least two insulated elements (5), the insulating layer (4) consisting of at least one polymeric material transformable at least at the surface into ceramic state at high temperatures in case of fire; and an outer sheath (6) enclosing said insulated elements (5), said cable having, in cross-section, an outer profile including at least two substantially planar and substantially mutually parallel surfaces, and the insulated conductors being adjacent to each other, side by side and their axes being located in a common plane included between said at least two surfaces. The invention relates to a safety cable fire resistant. More particularly, the present invention relates to a substantially flat cable fire resistant, which comprises at least two electrical conductors which are adjacent to each other. Security cables including power transmission cables or data transmission, such as for control or signaling applications. The fire-resistant safety cables must, during a fire, maintain electrical function. Preferably, said wires should also not spread fire. Said safety cables are used, for example, for lighting emergency exits and in elevator installations. The fire resistant cables must meet the criteria set in particular by the French standard NF C 32-070. According to this standard, the cable is deposited horizontally in a tubular furnace which is raised in temperature up to 920 0 C for 50 minutes. The cable must not present a short circuit during the rise in temperature as well for 15 minutes at 920 0 C. During this time, to simulate the falls of object during a fire, the cable is subjected to a periodic shock with a metal bar to shake the cable. The cables passing the test defined by NF C 32-070, paragraph 2-3 belong to the category CRl. Criteria similar to those defined in French standard NF C 32-070 are also defined by international standards, such as IEC 60331, or European standards, such as EN 50200. JP 01- 117204 and JP 01- 030 106 disclose two flat cables fireproof, said cables comprising a plurality of conductors surrounded by an insulator and an outer sheath of polyethylene, the insulating layer of each electrical conductor being formed of mica tapes. The Applicant has noticed that a flat cable fireproof which is provided with an insulating layer consisting of mica tapes. has several drawbacks. In particular, such a cable may have an interjoint space (or space revealing the driver) at the envelope mica tape, which causes a defect in the protection of the conductors leading to a short circuit. Fire-resistant cables having a substantially round cross-section are also known. For example, EP 942 439 discloses a security cable, round, fire-resistant and halogen-free, having at least one conductor, one insulation around each conductor and an outer sheath, empty spaces being provided between said sleeve and said insulation of each electrical conductor. The insulation of each conductor is made of a composition formed of a polymeric material containing at least one ceramic forming charge and capable of being converted at least superficially in the ceramic state at high temperatures corresponding to fire conditions . The outer sheath is made of a polyolefin composition containing at least a metal hydroxide filler. The applicant has noticed that a fire resistant cable with a round cross section has several drawbacks. For example, during a fire, a fire-resistant cable having a round cross section has a high risk of pollution of the insulating layer by the ash resulting from the combustion of the outer sheath. The applicant noted that this was mainly due to the mutual arrangement of individual elements. Indeed, in the case of a cable having more than two separate elements, at least one isolated component is superposed on the other to ensure a round cross-section of the cable. An isolated element generally comprises an electrical conductor and an insulating layer surrounding said conductor. In the case of a fire-resistant cable having a round cross section, the outer sheath is typically transformed, under the action of a fire, ash which may interfere with processing of the polymeric material of the ceramic insulator, resulting in the appearance of cracks in the insulation of the conductor. In addition, the superposition of the individual elements can cause a significant increase in the size of the cracks resulting from a crash (s) layer (s) insulator (s) contaminated (s) by said ash. These drawbacks lead to a reduction of the insulating protection layer or layers (s) insulator (s) of the cable and an increased risk of shorting circuiting of the conductors. These risks notably relate bunk isolated elements. In addition, these ashes can lead to an increase in volume and surface conductivity of the insulation, which affects the operation of the cable. In addition, the insulated electrical conductors (or isolated elements) used in the round security cables, fire resistant, are generally twisted. Twisting the individual elements leads to the existence of multiple contact areas between said individual elements, in particular from three elements, resulting in risk of shorting, for example where the insulation has defects in its structure, such as cracks that can be created during the ceramic conversion of the high temperature insulation on the conductors. Furthermore, during a fire, objects such that a beam or elements of a building structure, may fall and strike the cable and thereby damaging the latter and impair mechanical strength of the insulating ceramic transformed , or ceramic processing course of each element. The fall of such an object may lead, in the case of twisted elements, that a single element is compressed between said object and another element of the same cable, from damaging the insulation transformed into ceramic or during in ceramic processing, and thereby causing short-circuiting of the two conductors. In addition, the twisting cable elements usually leads to the formation of mechanical stress remaining inside the cable are released during a fire, which can damage the cable insulation material during processing ceramic layer. - an outer sheath surrounding said isolated elements, said presenting wire, in cross section, an outer profile comprising two substantially flat faces and substantially parallel to each other, the individual elements being adjacent to each other, side by side, and their axes lying in the same plane which is between said at least two faces. This cable is preferably halogen-free and fire-retardant not. By "halogen-free cable" means a cable whose constituents are substantially no halogens. Even more preferably, the components do not contain any halogen compound.~ "
As mentioned above, the fire-resistant cable according to the present invention is substantially flat, that is to say it comprises at least two substantially flat faces and substantially parallel to each other, the individual elements being adjacent between them and their axes lying in the same plane which is between said at least two faces. Preferably, the cable sheath in cross section, has an outer contour (or outside profile) which substantially follows the shape of the envelope isolated elements that are located within the cable sheath, their axes lying in the same plane. In more detail, the cable sheath preferably has a thickness which is substantially constant over the extrados isolated elements and which can be reduced to a minimum value sufficient to give the cable the typical cable protection sheath. In this manner, the cable of the present invention leads to a reduction of the amount of cladding material used for the realization of the cable, in particular for two-conductor cable. This leads firstly reducing cable manufacturing costs, and also a decrease in the glow time, the heat energy released during a fire and the amount of ash resulting from the combustion of the sheath. These aspects are particularly advantageous because the risk of cracks can be caused by ash in ceramic processing of insulation to high temperatures of a fire can be reduced significantly. Furthermore, for cables from three conductors, the outer surface of the sleeve is greater in the present invention, which allows a better thermal exchange and a better and faster combustion of the sheath that less disruptive processing ceramic of the insulator when the fire. The particular arrangement of individual elements as defined in the invention, also possible to increase the electric strength of the conductors by reducing any shorting circuit conductors. Indeed, during a fire, this particular arrangement of the individual elements for limiting the number of contact areas between the individual elements, in particular for a cable from three individual elements, also leads to a limitation of the risk of setting short-circuiting during the ceramizing insulation or when the insulator is already in the form of ceramics. Moreover, the fact of not having twisting isolated elements, helps to remove residual mechanical stresses on each item, due to this twisting, which could break free during the fire and alter the integrity of the cable and especially that of the insulation being transformed into ceramic or already in the form of ceramics. The aligned arrangement of individual elements in the same plane (that is to say the arrangement consisting in that the individual elements are mutually adjacent and side by side) also allows an easier manufacturing of the cables by deleting 'twisting step, and a stack of cables during installation, less cumbersome than that obtained with round cables. Advantageously, the cable of the present invention has, in cross section, a substantially rectangular outer profile, more particularly two substantially flat faces and substantially parallel to the plane comprising the axes of the conductors, and two substantially curved side portions which are connected to said two faces . Preferably, as mentioned above, the fire-resistant cable, substantially flat of the present invention comprises a cable jacket having an outer contour which substantially matches the shape of the envelope elements isolated. For example, for a two-conductor cable, the cable and has in cross section a shape of "8". PVC), or a mixture thereof. The outer sheath material may further comprise inorganic fillers may be transformed into residual ashes under the effect of high temperatures of a fire, such as chalk, kaolin, metal oxides such as hydrated alumina, and metal hydroxides such as magnesium hydroxide, metal oxides or hydroxides can be used as flame-retardant fillers. The outer sheath material may optionally be expanded so as to notably improve the resistance to shock of the cable, shock which may be soumi s after the fall of an object during the fire. The outer sheath may be in the form of a single layer or of several layers of material (s) polymer (s), e.g., 2, 3 or 4 layers. For example, it is possible to provide the cable with a suitable cladding layer for imparting a particular technical function, for example, for absorbing accidental impact on the cable, or improve resistance to cable fluids. In the cables of the invention, the insulating layer is made in particular from at least one polymeric material capable of being converted at least superficially in the ceramic state at high temperatures in fire, in particular in the range from 400 0 C to 1200 0 C. This transformation to the ceramic state of the polymeric material of the insulating layer makes it possible to maintain the physical integrity of the cable and its electrical operation under the conditions of the fire . The polymeric material of the insulating layer is preferably a polysiloxane such as a crosslinked silicone rubber. The insulating material may further comprise preferably a ceramic forming charge under the effect of high temperatures of the fire, such as silica or metal oxides. According to another embodiment of the present invention, the polymeric material of the insulating layer may be foamed. This expansion enables including improved impact strength of the insulated conductor, shock which it can be submitted in a fire after the fall of an object such as joist. The insulating layer may be in the form of a single layer or of several layers of material (s) polymer (s), such as 2 or 3 or more layers. A stuffing material may further be between the insulating layer of each conductor and the outer sheath. PVC), or a mixture thereof. The material of filler may further include inorganic fillers may be transformed into residual ash under the effect of high temperatures of a fire, such as chalk, kaolin, metal oxides such as alumina hydrate, or metal hydroxides such as magnesium hydroxide, metal oxides or hydroxides can be used as flame-retardant fillers. According to a particular embodiment of the invention, the cable comprises at least two separate elements, each isolated element comprising an insulating layer surrounding an electrical conductor, said elements being arranged side by side and separated by a space. The space is located in a transverse position relative to the axes of the cable conductors. Preferably said gap is about 0, 1 mm to about 20 mm, more preferably about 1 mm to about 3 mm. This axial gap is preferably filled by the material of the sheath as defined above, or a polymeric material capable of being converted at least superficially in the ceramic state at high temperatures in fire, same or different from that used in the insulating layer, or by a material jam. In the case where said space is filled with the cable sheath material, the cable sheath is fed, for example by extrusion, so that it completely surrounds the isolated elements. This embodiment allows to further limit the risk of setting short circuit mentioned above. Another preferred embodiment consists in that the individual elements are arranged one beside the other and are substantially in contact with each other so that no space is present between two adjacent single elements. Fig. 1 shows a view of a cable side of the invention. Fig. 2 shows a sectional view of a cable having two electrical conductors, according to a first embodiment. Fig. 3 shows a sectional view of a cable having three electrical conductors, according to a second embodiment. Fig. 4 shows a sectional view of a cable with four electrical conductors, according to a third embodiment. Fig. 5 shows a sectional view of a cable having two electrical conductors, according to a fourth embodiment. Fig. 6 shows a sectional view of a three-conductor cable, according to a fifth embodiment. Fig. 7 shows a sectional view of a four-conductor cable according to a sixth embodiment. Fig. 1 shows schematically and partially a cable 1 having an axis of symmetry 2. The cable 1 according to a first embodiment, shown in Fig. 2, comprises two electrical conductors 3, two insulating 4 - each insulating 4 lying around each conductor 3 and thus forming two insulated conductors (or elements) 5 - and an outer sheath 6. The two insulated conductors 5 are disposed parallel relative to each other and side by side in the cable longitudinal median plane P 1. They are in contact with each other, resulting in that 'no space is present between the adjacent elements. The outer sheath 6 is deposited on the insulated elements 5 and surrounds the insulated elements 5 so as to define at least two faces that are substantially planar and parallel to each other and the longitudinal median plane P.
In section, the cable has a substantially rectangular shape, in particular a profile having two parallel plane faces the plane P containing the axes of the two conductors 3 and two rounded lateral portions. The insulating material 4 is preferably a polysiloxane comprising in particular a type of silica reinforcing filler and the insulator 4 comprises preferably a single layer of polysiloxane. The outer sheath 6 is preferably formed by an EVA, optionally including fillers such as metal oxides or hydroxides. According to another embodiment (not shown) similar to that shown in Fig. 2 except for the shape of the outer jacket 6 in cross section, the outer sleeve 6 has an outer contour that substantially matches the shape of the envelope isolated elements 5 so that the cable has a cross-sectional shape "8". The cable of Fig. 3 differs from that of Fig. 2 in that an additional 5 isolated element is inserted within the outer sheath 6, the axis of this additional insulated element 5 lying in the longitudinal median plane P of the cable 1. The cable of Fig. 4 differs from that of Fig. 3 in that an additional 5 isolated element is inserted within the outer sheath 6, the axis of this additional five insulated conductor located in the cable longitudinal median plane P 1. The cable of Fig. 5 differs from that of Fig. 2 in that a space 7 between the two insulated elements 5 and in that the outer sheath profile substantially follows the envelope of insulating layers 4. The cable of Fig. 6 differs from that of Fig. 5 in that three individual elements 5 are shown. The cable of Fig. 7 differs from that of Fig. 5 in four isolated elements 5 are represented. The spaces 7 in Figs. 5, 6 and 7 are preferably filled with the material of the sheath, such as an EVA. These spaces 7 measure preferably 0, 1 mm to 20 mm, more preferably from 1 mm to 3 mm. 2 x 1.5 mm 2 (composition 1) and 3 x 1.5 mm 2 (composition 2). According to the French standard NF C 32-070, a fire-resistant cable must withstand a voltage of approximately 500 V when the temperature rise up to 920 0 C for 50 minutes and then at a constant temperature of about 920 0 C for about 15 minutes. All cables tested met this minimum value required by the standard. cables were then tested by gradually increasing the voltage until a short circuit occurs. 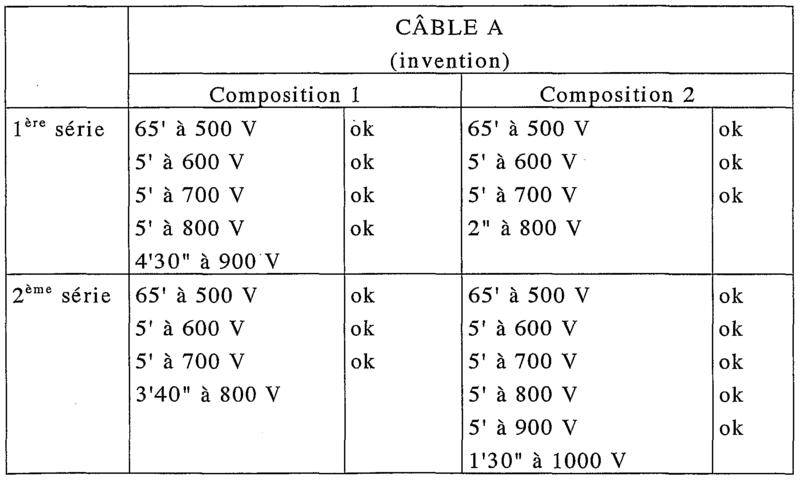 The results of these tests - which are summarized in Tables 1 and 2 - show that the flat cable of the present invention is capable of withstanding voltages higher than those borne by the comparative round cable. 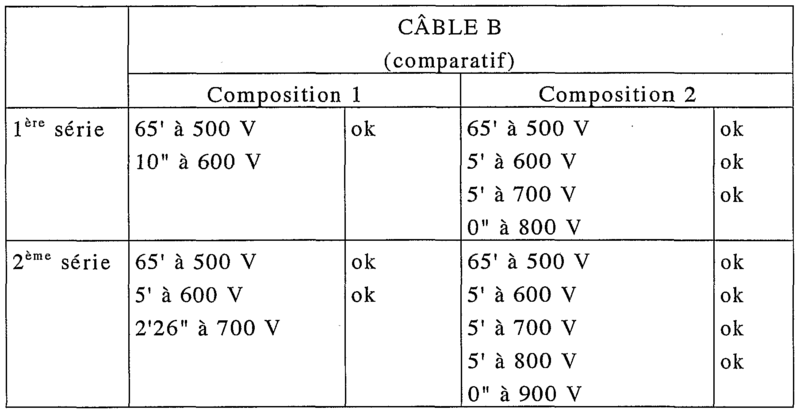 Indeed, the data tables show that cable A of the invention withstand voltages higher than those supported by the cables B, or so they support the same voltage but for a greater period of time than the cables B . - an insulating layer (4) around each electrical conductor (3) for obtaining at least two individual elements (5), the insulating layer (4) being formed from at least one polymeric material capable of being converted at least superficially in the ceramic state at high temperatures in fire, and an outer sheath (6) surrounding said insulated elements (5), said cable having, in cross section, an outer profile comprising two substantially flat faces and substantially parallel therebetween, the insulated conductors being adjacent to each other, side by side, their axes lying in the same plane between said at least two faces. 2. Cable according to claim 1, characterized in that said outer profile is substantially rectangular. 3. Cable according to claim 1, characterized in that said outer profile has two rounded lateral portions connected to said two faces. 4. Cable according to any one of the preceding claims, characterized in that the outer jacket substantially matches the shape of the envelope comprising said at least two individual elements (5). 5. Cable according to any one of the preceding claims, characterized in that said outer sheath (6) has a thickness which is substantially constant on the suction casing comprising at least two individual elements (5). 6. Cable according to any one of claims 1 to 5, characterized in that said at least two individual elements (5) are substantially in contact with each other. 7. A cable according to any one of claims 1 to 5, characterized in that at least two individual elements (5) adjacent to each other, side by side are separated by a space (7). 8. Cable according to any one of the preceding claims, characterized in that the outer sheath material (6) comprises an ethylene / vinyl alcohol copolymer, a polysiloxane, a polyolefin, poly (vinyl chloride), or a mixtures thereof. 9. Cable according to any one of the preceding claims, characterized in that the outer sheath material (6) further comprises inorganic fillers may be transformed into residual ashes under the effect of high temperatures of a fire. 10. Cable according to any one of the preceding Claims, characterized in that the material of the sheath (6) is expanded. 11. Cable according to any one of the preceding claims, characterized in that the outer sheath (6) is in the form of several layers of polymeric materials. 12. Cable according to any one of the preceding claims, characterized in that the polymeric material of the insulating layer (4), capable of being converted at least superficially in the ceramic state at high temperatures in fire, is a polysiloxane. 13. Cable according. any one of the preceding claims, characterized in that the polymeric material of the insulating layer (4) contains a ceramic forming charge under the effect of high temperatures of the fire. 14. Cable according to any one of the preceding claims, characterized in that the polymeric material of the insulating layer (4) is expanded. 15. Cable according to any one of the preceding claims, characterized in that it comprises a stuffing material between the insulating layer (4) of each conductor (3) and the outer sheath (6). 16. Cable according to claim 15, characterized in that said stuffing material is composed of an ethylene / vinyl alcohol copolymer, a polysiloxane, a polyolefin such that polyethylene, poly (vinyl chloride), or a mixture thereof . 17. Cable according to claim 15 or 16, characterized in that said stuffing material comprises further inorganic fillers may be transformed into residual ashes under the effect of high temperatures of a fire. 18. Cable according to Claim 7, characterized in that said space (7) is filled by the material of the sheath (6). 19. .A cable according to claim 7, characterized in that said axial gap (7) is filled with a polymeric material capable of being converted at least superficially in the ceramic state at high temperatures in fire. 20. Cable according to claims 7 and 15, characterized in that said axial gap (7) is filled with the tow material. BE900405A (en) 1985-02-22 On fire, and oil-resistant cable. ES2112594T5 (en) 2004-01-16 flame retardant composition for the manufacture of electrical cables with insulation maintenance and / or operation.